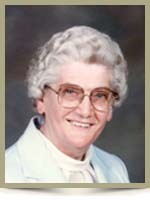 WENTZELL – Edith Winnifred, 91, of Queens Manor, Liverpool, formerly of Milton, passed away peacefully in Queens Manor, on March 30th, 2012. Born in Milton, she was a daughter of the late Seward and Bertha (Godfrey) Coombs. Edith worked as a store clerk for 18 years with Thorne’s Hardware Store in Liverpool and previously at Walker’s Store and Payzant’s Store. She was a member of the Milton Baptist Church, as well as a member of the Arbutus Chapter # 30, Order of the Eastern Star and received her fifty year’s jewel. She was active in her community canvassing for various charities and functions and also volunteering at the Manor. She is survived by her sons, Douglas of Bridgewater and Norman (Bonnie) of Mill village, daughter-in-law Sandra Wentzell of Victoria, BC. Grandchildren Theresa (Mike) Brideau, Carolyn (Marcus) Gibson, Gail (Ian) Reid and Charles Wentzell. Great-grandchildren Eric, Dylan, Connor, Olivia, Abigail, Hannah and Emily. She was predeceased by her son Eric, sisters, Lorna Nickerson, Margaret Cole and Norma Legere, brother Aubrey. condolences on the passing of your mother. She was a lovely lady. I was so deeply saddened too see that Edith has passed. I AM GLAD I WENT AND SEEN HER AND SPENT SOME QUALITY TIME BEFORE I LEFT LIVERPOOL.MY PRAYERS AND THOUGHTS GO OUT TOO THE FAMILY.GOD REST DEAR FRIEND. We were so sorry to see of your Mom’s passing Norman, Ira and I are sending our condolences to you all at this most difficult time. Hold on to all of the memories that you have they will help you get through this. We are saddened to hear of Edith’s passing. I grew up in Milton and knew Edith most of my life. What a Great Lady She was. She always had time to stop and talk. She waited on me numerous times at Walker’s grocery store in Milton and was always so pleasant. She will be missed by all who knew her. May God Bless you and all your Families at this most difficult time but always remember the Happy times you had with Edith, and I’m sure there are too many to mention. God Bless you Edith, May you now Rest In Peace!!!! She will be missed,a very nice lady. So, Sorry to hear of Edith’s passing. I worked with Edith at Thornes for a number of years. We use to have quite a few laughs. She is now at Peace. Take care of yourselves. Norman , Bonnie and family, our thoughts are with you in the loss of your mother and grandmother. Edith was always such a pleasant lady and will be greatly missed. We were so sorry to hear about Edith. She was such a pleasant person and we enjoyed our talks with her whenever we would run into each other. Bonnie,Norman & family,so sorry to hear of Edith”s passing,Thinking and praying for you and your family at this sad time..
norm & family ,edith was a lovely lady ,so sorry for your loss. Please accept my sincere condolences on the loss of your Mom. Edith was a special person and many have fond memories that will live on. May knowing that she is now safe in the arms of Jesus free of earthly sufferings, ease your heartache. May knowing others share in your loss bring a measure of comfort. You are in my thoughts and prayers during this difficult journey. Thinking of you often. Norman, Bonnie & Family our deepest sympathy to you all in the loss of Mrs. Wentzell. May memories of happy times spent together help you at this sad time. Our prayers are with you. Your mom was a very special person and I am so sorry to read of her passing. Blessings to all the family. I was so sorry to hear of Edith’s passing. We worked together at Thornes and shared many laughs and good times. She will be greatly missed. My thoughts and prayers are with you at this time. Just heard of our loss- Aunt Edith was our last aunt and we thought so much of her. She is in a better place tnan she was lately. She was a dear lady!Condolances to all the family. My heart is heavy as I know yours is too. I’m sending prayers and my thoughts are with you. I am so sorry I can’t be there at this time but I want you to know I am glad to have been a part of your lives. We have lost someone very special and we will miss her forever. Bonnie, Norman and family: I was saddened to read of your dear mothers passing. She will always be remembered for her beautiful smile and her loving ways. Have comfort in knowing she will be missed, and others grieve with you and your family. We were so sorry to hear of your Mother’s passing. I remember as a kid growing up running across the road and spending a lot of time at your house. Edith was a kind, generous person who will be sadly missed. Our sincerest condolances. Sorry for your loss. Edith was such a friendly lady. My thoughts are with you at this most difficult time. To Edith’s Family, please accept my sincere sympathy at this sad time. Norman & Bonnie & Family – My sincerest condolences on the passing of your Mother. My thoughts and prayers are with you during this difficult time. So, sorry on the passing of your mother and grandmother.Our thoughts and prayers will be with you all. May she R.I.P. Sincere condolences on the passing of your loved one. Norman, Bonnie and family, sorry to hear of your loss. My condolences to Edith’s family during this sad time. She was a great lady and will be sadly missed. All of Edith’s Family, I am so sorry to hear of Edith’s passing. She was a great lady. R.I.P friend. my condolences to Norman and Bonnie for loss.aunte Edithès was awsome aunte!! !.spent a lot of time with her…i have so many memories.when i was home 2 years go…family bbq.will miss you..love you for ever..xoxo,R.I.P AUNTE Edith..
Norman and Bonnie and family we are very sorry to hear of your loss and thoughts and prayers are with you in this difficult time. Jamie and Family. So sorry for your loss. She will be thought of fondly. So sorry for your loss. We know she was very special to her family and friends and she will always be remembered for her beautiful smile and her kind loving ways. Edith was a good friend and we spend many hours together in days past… I will miss her….Love and prayers I send to her family. Aunt Edith was such an inspiration . Her kindness, love of life, gentle spirit, and optimism have touched so many – truly a bright light who will never be forgotten. I consider myself extremely fortunate to have spent many childhood hours in her company. Her family feels this way 100 times as much, and I know we are all so grateful to have known her, and sad to see her pass on. We will miss you Edith. You were great with my kids- they will miss you and so will I.
of your Mom. , she was a beautiful person inside and out… and memories are what we have to hold onto…our heartfelt sympathy to all of you. I am so sorry to hear of Edith’s passing. She was a wonderful and sweet woman. She always had a smile and kind word for everyone. She was an important part of my childhood and I will always cherish my memories of her. We didn’t know your Mom but please accept our deepest sympathy at this sad time. Sorry to hear of your Mom’s passing. Memories of going down east in the summers have always included a visit with Aunt Edith. Her sense of humour and optimistic, down to earth nature always impressed me. How fortunate we were to have visited her one last time this past summer. She will be greatly missed by all those who have known her. Our deepest sympathy to you and your family on the passing of your mom. I always enjoyed talking to your mom when she worked at Thorne’s and when she came to church services in Mill Village.Our prayers and thoughts are with you in your time of sorrow.May God bless and help you through this sad time. Jim and I would like to pass along our most sincere condolences on the loss of your mother. Edith will always hold a special place in our hearts. Her memory will shine on forever and sustain you during this difficult time. Our thoughts and prayers are with you today. I know that Edith would be so pleased that so many of her friends and family were together to celebrate her life. Her caring for others and good will will be remembered by all who knew her. We will miss seeing Edith. Our thoughts are with your family. Norman, I’m so sorry to see your mom’s obituary on here, I didn’t know of her passing, or I would have been in touch.